1. Penn’s Landing & Delaware River - ONLY 1 BLOCK AWAY! Penn’s Landing, located just a short walk from Old City and Philadelphia’s Historic District, is home to some of the city’s biggest attractions and hosts festivals and events all year long. You can view the historic Benjamin Franklin Bridge from here as well! Explore this amazing park, complete with a boardwalk, a floating restaurant, beer gardens, games and more. Colorful hammocks all over the park! The Spanish-American War cruiser Olympia (below) and the World War II submarine Becuna — both docked nearby. This attraction offers folks the rare opportunity to board these two landmark ships. Christ Church, a National Historic Landmark, is an Episcopal church in the Old City neighborhood of Philadelphia. In the church's burial grounds, where visitors can view the graves of Benjamin Franklin and his wife as well as those of several signers of the Declaration of Independence and other early American leaders. Free Franklin Post Office & Museum is the only Colonial-themed post office operated by the United States Postal Service. The museum on the second floor features displays of postal history and memorabilia. The Betsy Ross House is a landmark in Philadelphia purported to be the site where the famous seamstress and flag-maker Betsy Ross (1752-1836) lived when she sewed the first American Flag. 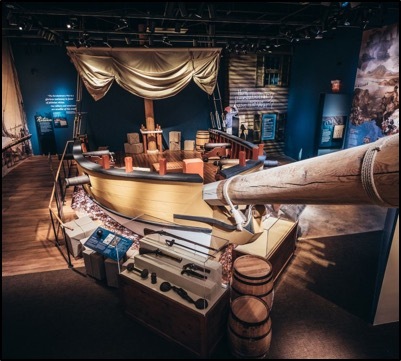 The Museum of the American Revolution (formerly The American Revolution Center) is a Philadelphia museum dedicated to telling the story of the American Revolution. Scene of political and commercial activity in the colonial period, the London Coffee House opened here in 1754. It served as a place to inspect Black slaves and to bid for their purchase at public auctions. 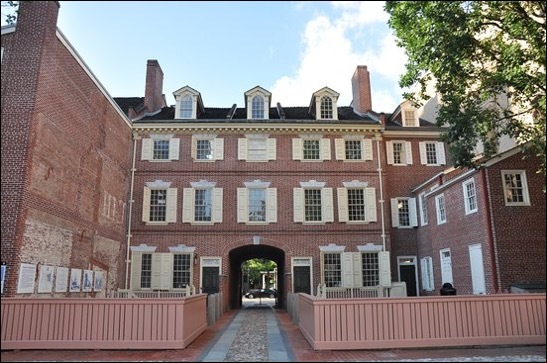 Elfreth's Alley is a National Historic Landmark, is the nation’s oldest residential street, dating to 1702. Each house and cobblestone on this alley is carefully preserved to evoke the architecture and atmosphere of the street 300 years ago.